ChronosDragon wrote: She slowly but surely catches up. We should prepare a ceremony for when she finally reaches us, in the future! You are right! If Helper is still AWOL, I propose we make BlitzGirl the new Pope upon her arrival! And on page 325 BlitzGirl wrote: Quest progress: 267 out of 325 pages. So in another twenty-one pages, we'll have a new Mome! Huzzah! Several times Helper made reference to "outside duties", which may be the cause of the appearance of his desertion. Work it, Cueball, work it! Well, depends on whether you count the previous ninjaed post or not, I reckon. tman2nd wrote: No posts in between? It's not our fault Cueball builds so slowly. Bring Megan back and we'll have something to type about. Valarya wrote: Did the search-party for Pope Helper ever turn up? I'm starting to think he isn't taking his pope-ing seriously. An alternative solution to the low pH level would be to send a group of Knights Temporal1 to politely inform2 the Outsiders that all their base are belong to us. 1 What does one call a group of Knights Temporal? Watch doesn't seem fitting when they're not on watch. 2 Better bring the trebuchet just in case, they aren't the most reasonable people. We could toss this out for speculation: Do y'all think the left tower will be a clone of the right one, or significantly different? If different, how? 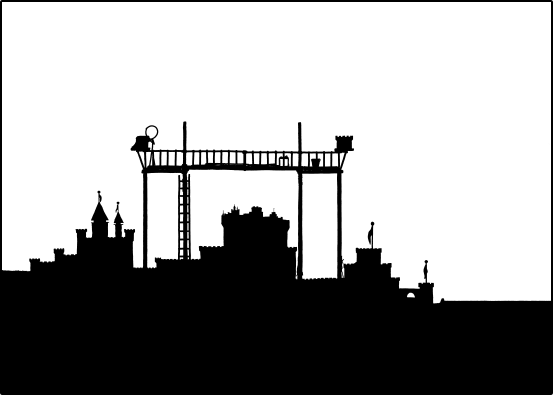 I'm kind of thinking maybe a pointy tower instead of a crenellated one, in parallel with the castles below, would make sense, but it really doesn't look like it so far. ZombieLion wrote: An alternative solution to the low pH level would be to send a group of Knights Temporal1 to politely inform2 the Outsiders that all their base are belong to us. They definitely need to make their Time. KarMann wrote: We could toss this out for speculation: Do y'all think the left tower will be a clone of the right one, or significantly different? If different, how? I think it'll be the same. If they're building a larger version of any of the sandcastles below the platform, the castle just below him, on the left (with the two pointy towers capped with flags) seems to be a match. I'll do it, so long as I don't have to actually do anything. I like it, but then what will we call our fort? Fort of the Fortknight of Knights Temporal. Simple. D'oh! The answer was so obvious! It's brilliant! and then the Fort of the Forknight. They prod with the Thrice Timed Fork. Or is it the Twice Tined Fork? Whichever. Davidy wrote: If "Z" is one meter, the platform would still tip if were only half that width. When the platform bases were brought in and raised they were shown to be about 1/2 as wide as the length of the small ones. If they're as long as, for instance, Megan is tall, they'd be just under 3 feet wide. They wouldn't rest securely on 8-10 inch posts. We don't know how big the posts are but, assuming they're wood, they can't be too big - remember, Megan was able to lift and place them by herself. If Z is one meter maybe they are jamming the boards into the sides of the universe for better stability. That's one of the best sentences I've ever heard. Might need to sig that. Are these forknives being discussed related to sporks? Last edited by vvn on Mon Apr 15, 2013 12:23 am UTC, edited 3 times in total. Spork would be better for castle manipulations. It's obvious: they1 are in coma, like they said. "I'm pretty tired. I think I'll go home now." "Now what do we do?" That's odd, I'd think that an Arch-Cardinal such as yourself would prefer a top-down approach. Coffee?!?? They threw Coffee?!? This is getting ridiculous . . . I want a raptor and an armed marine boarding party! Last edited by Davidy on Mon Apr 15, 2013 1:24 am UTC, edited 1 time in total.